The morning of my ninth half marathon started with a plentiful room service breakfast that the Fairmont Southampton kindly arranged for us. Fruit, coffee, bagels, yogurt…I was in heaven. 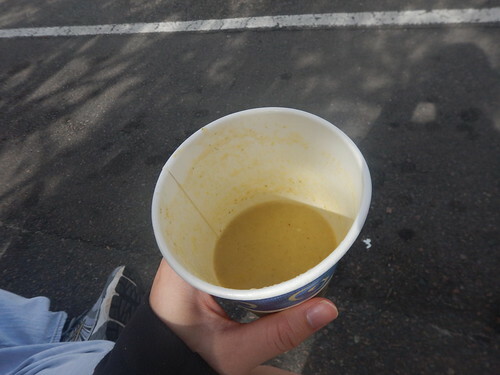 I joked that I’ve learned a lot since my first half marathon, which started with me trying to drink my instant oatmeal out of a paper cup because I had forgotten to pack a spoon. 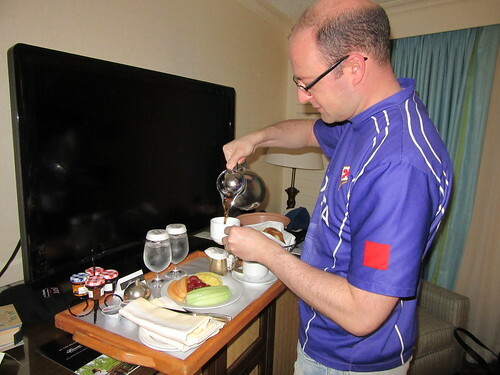 Dan with the delicious room service breakfast. It was the perfect way to fuel up before the half marathon. The shuttle driver was listening to talk radio and after a while we realized that the program was about attempting to simulate labour symptoms in men and what their reactions were. After several minutes of awkward silence we finally arrived at the race start. 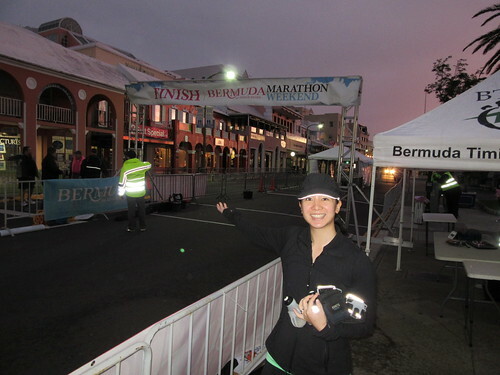 Me and the finish line in the early morning before the half marathon. 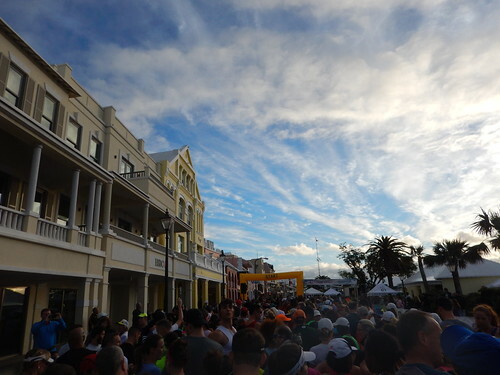 The race starts and finishes on Front Street. 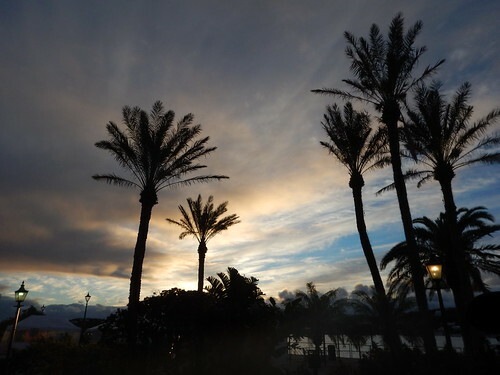 Since we arrived so early we took a walk along the boardwalk and watched the sunrise. It was beautiful and definitely one of my most memorable race starts. 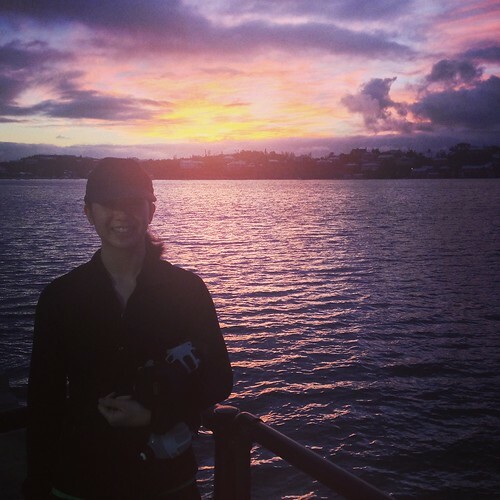 Me and the sunrise before the race. Me and the birdcage on Front Street in Hamilton. 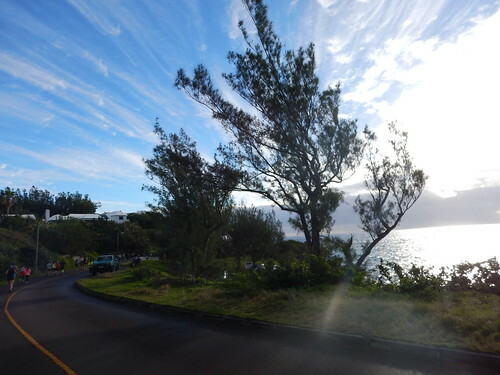 Palm trees as the sun rises in Bermuda. When it was time to start the race I lined up in the self seeded corral. I found myself near a woman in a red Sporting Life 1ok shirt. It reminded me of home. 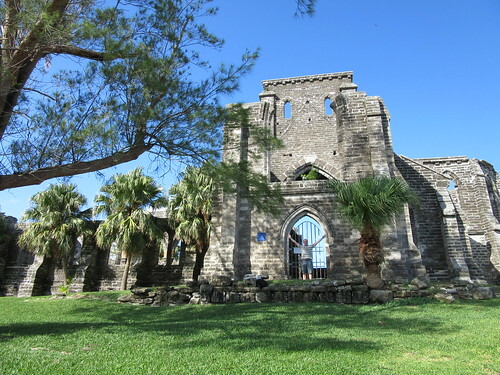 View from the starting corral. Before the race started, the Town Crier gave a speech welcoming us and wishing us all a safe and fun race. After a few minutes they sounded the horn and we were off! Starting the race. Photo courtesy of Bermuda Timing. Less than a mile in I found myself climbing my first hill. 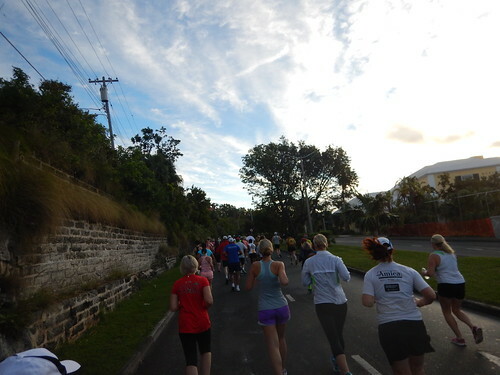 The course was definitely hilly but not as challenging as the 10k the day before. Near the start of the race course and leaving Hamilton. Less than a mile in we approached our first hill. You can see it in the distance. My race plan was to try to finish in around 2 hours. My half marathon clinic instructor Tim had told me that even though I was using the race as a training run, that I should still try my best. 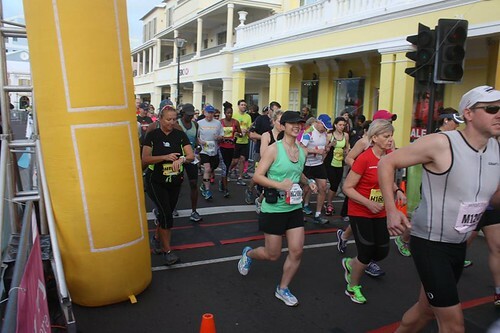 He suggested keeping a 6 minute per kilometre pace and trying to run the second half as evenly as the first. At around 6k my quads felt tired from the race the day before and I knew that the 6 min/kms weren’t going to happen. 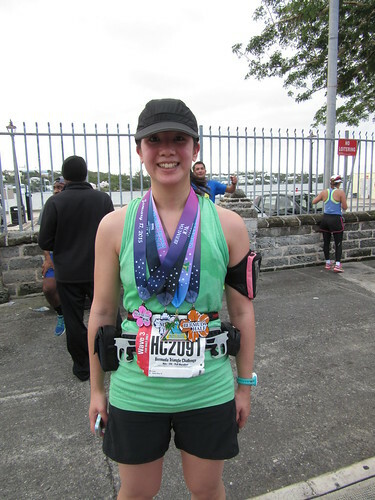 I changed my goals so that my A goal was to finish in 2:16 or faster (2:16 was the time I ran the first 21.1 kms during my marathon in 2013), my B goal was to finish in 2:21:54 or faster (my PB from the Disneyland half in 2012) and my C goal was to finish in 2:30 or faster (my average finishing time at this point). I used to set only one goal and then feel disappointed if I didn’t meet it. Sometimes that would overshadow my other achievements so I decided to start setting A, B and C goals. This was really effective for me in 2015. 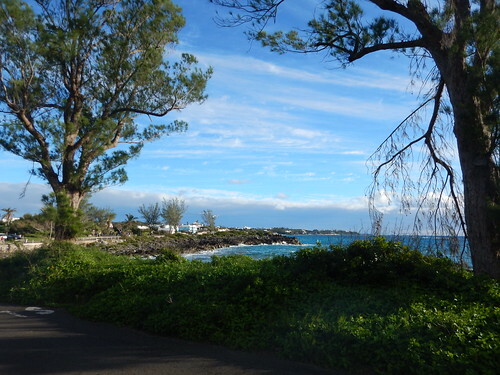 As I ran I couldn’t stop looking to the right and seeing the ocean and the blue sky. More ocean. I couldn’t get enough. The weather was perfect. We had blue skies, sunshine and some light wind. It was approximately 16 C and I was soaking up every minute of it. The hills were challenging but I refused to walk. 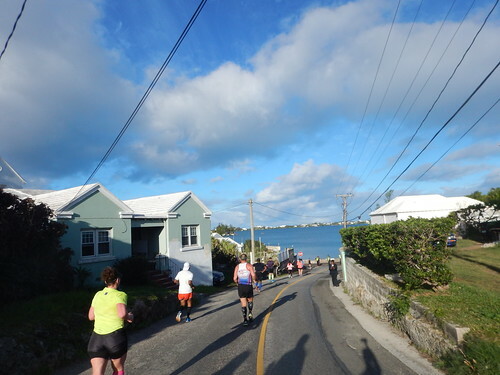 I kept thinking about all of the hill training I’d been doing in -30 C weather and thought “I didn’t run all those hills in the cold to walk up a hill in Bermuda!” This kept me going. Balancing out the challenge of the hills was the ocean. I just had to turn and look to my right and everything felt better. 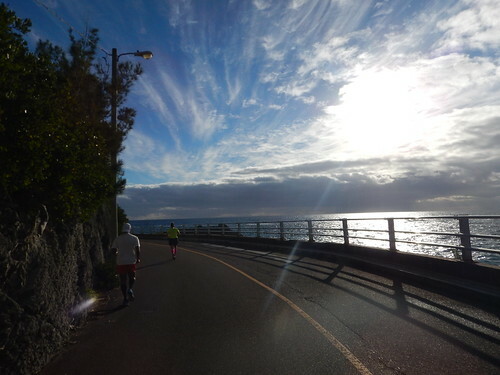 I ran with my camera today and was running, smiling and taking pictures. People probably thought I was crazy. Some of the spectators shouted “Look at her taking pictures!” and “Keep smiling girl! Keep smiling!” The spectators were friendly and encouraging, which made the race even more fun. 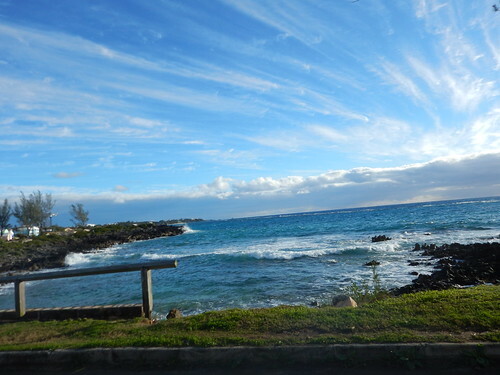 More ocean and blue sky. 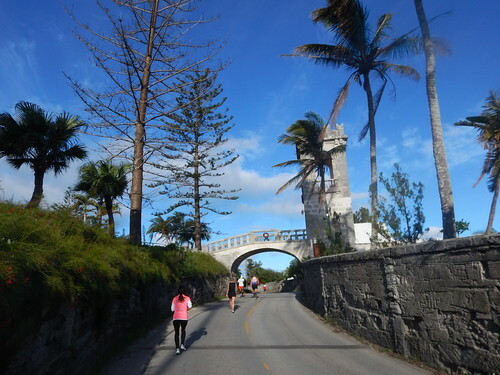 This was one of the most beautiful race courses I have ever run. 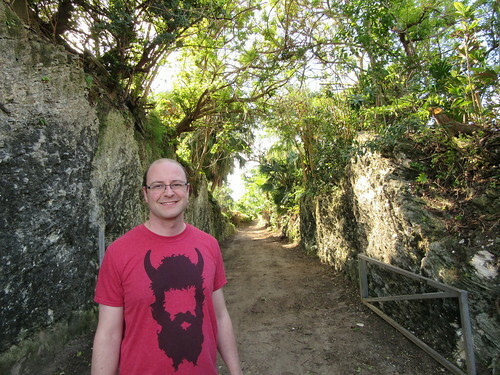 When I reached the famous Devil’s Hole Hill that everybody had been talking about I started to laugh. It was more like a bump than a hill! Running through Flatt’s Village was also a highlight. It was quaint and picturesque and the crowds there were also encouraging. I received a few more “Keep smiling girl!” comments. I honestly couldn’t stop smiling and probably smiled for the entire race. Heading into Flatt’s Village. The crowd on the left by the blue building cheered “Keep smiling girl!” as I ran by. 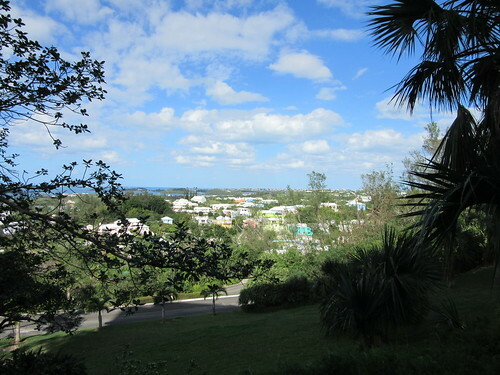 Another view from the race course. 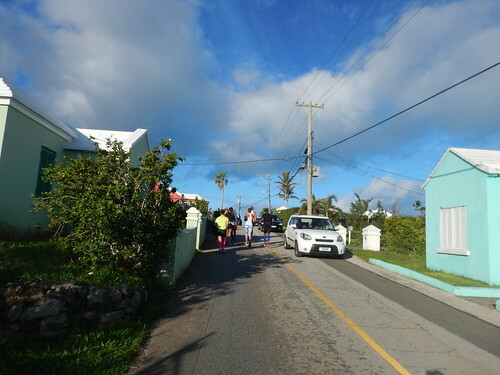 I loved running through all of the villages etc. 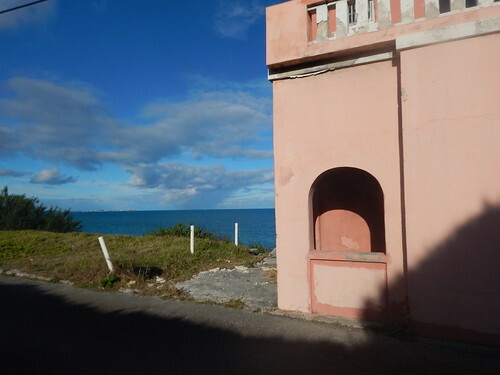 and seeing the coloured houses and then more ocean. The roads weren’t officially closed to traffic but there weren’t too many cars. The organizers did a good job of controlling this. There was only one spot where a car drove onto the course and I was momentarily stuck behind it. I thought it was hilarious that a car slowed me down. 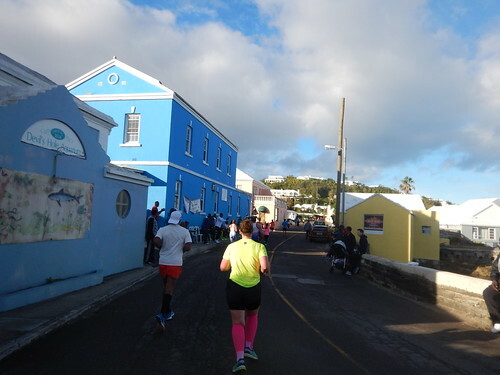 I loved seeing the coloured houses against the backdrop of the ocean. So beautiful. I had to slow down and run behind this car for a bit! I couldn’t go in the other lane because there was traffic coming from that direction. At around 17kms I started to feel tired. I ran this race before I learned how to fuel properly. I only took a few shot blocks, which I’ve since learned is only the equivalent to maybe half a gel. I stopped taking pictures around this point. Finally, I was heading back to Front Street. 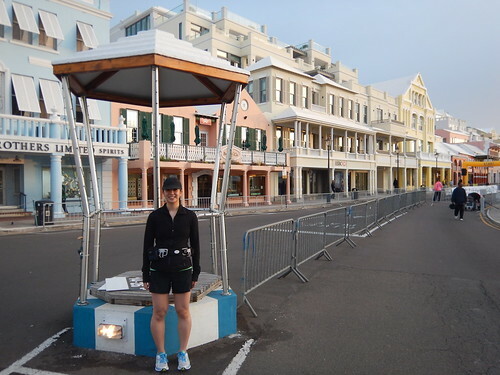 I was so excited when I saw the bird cage that I tried to run straight through but the race volunteers told me I had to go to my left and up another small incline. 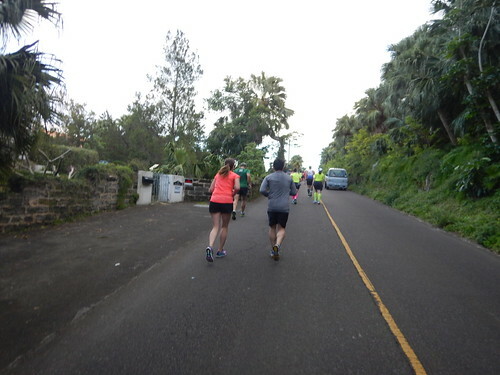 I started shouting “For the half marathon?” and they said it was. I had it in my head that they would accidentally send me back onto the course for the full. 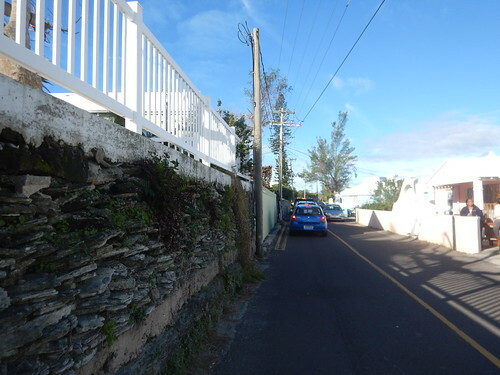 When I got back onto Front Street I knew that I was close to my goal. I saw Dan up ahead and sped up. 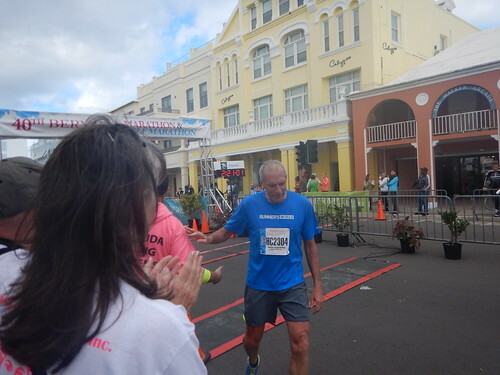 I was so excited and when I crossed the finish line I knew I had run my first half marathon PB since 2012. I finished in 2:11:57! A PB by approximately 10 minutes. I was ecstatic, especially considering I hadn’t tapered and had run a challenging 10k the day before. Action shot of me crossing the finish line. 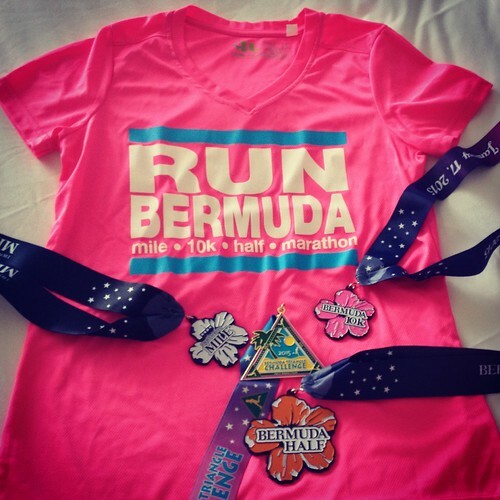 Photo courtesy of Bermuda Timing. 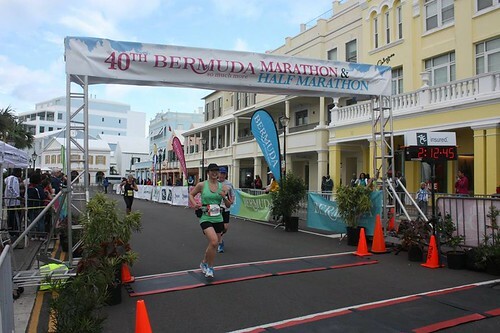 Photo courtesy of Bermuda Timing. After I finished, we watched Bart Yasso, chief running officer for Runner’s World and also known as the “Mayor of Running” cross the finish line. Then we watched the winner for the full marathon finish. People who run the full marathon must have mental toughness. 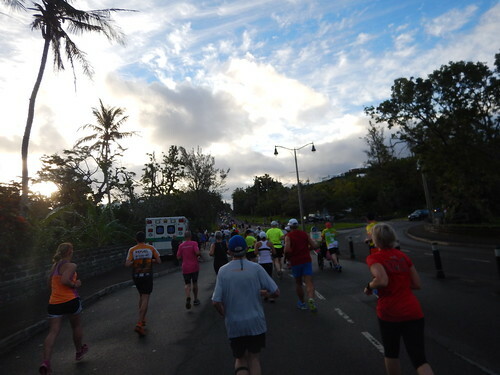 To run the full marathon course you run the half marathon course, run past the finish line and then run the half course again. Bart Yasso right after crossing the finish line. 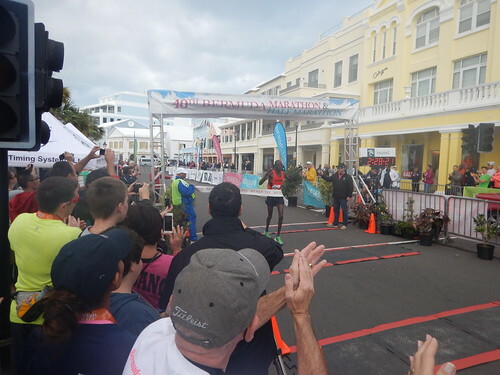 Benjamin Meto breaks the tape on the marathon finish line! Dan also told me about male winners of the half marathon. They were two Bermuda runners who made a pact and finished together, hand in hand. 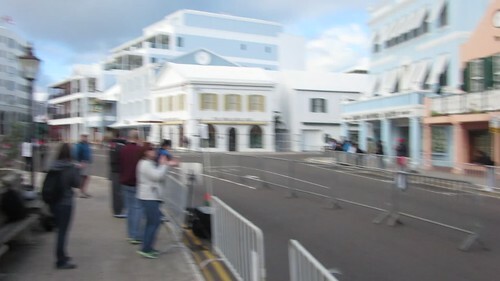 Dan took this video of the Town Crier’s speech before the start of the race. 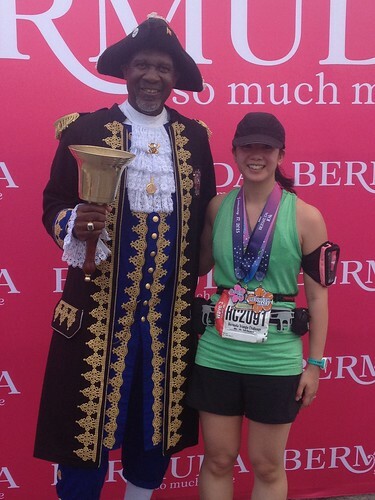 I made Dan carry my other two medals, so when I got my half marathon medal and my Bermuda Triangle Challenge medal I put them all on and took my picture with the Town Crier. After refuelling, we took a short walk to the bus stop and rode it back to our hotel. Proudly wearing my four medals! They had soup at the finish line. It was delicious. Standing with the Town Crier. 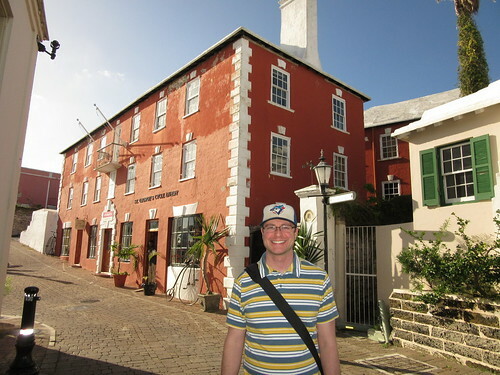 We spent the afternoon at the Royal Naval Dockyard where we had lunch at the Frog and Onion, taste tested some delicious Bermuda rum cake at the Bermuda Rum Cake factory and sat and watched some glassblowing. It was a relaxing afternoon. Taste testing Bermuda rum cake. It was so good! Mei at the Royal Dock Yards. It was windy and rainy that afternoon. We were very lucky with our race morning weather! That evening we had dinner in the Waterlot Inn at our hotel. With my races finished, this was a good chance to finally relax and indulge. 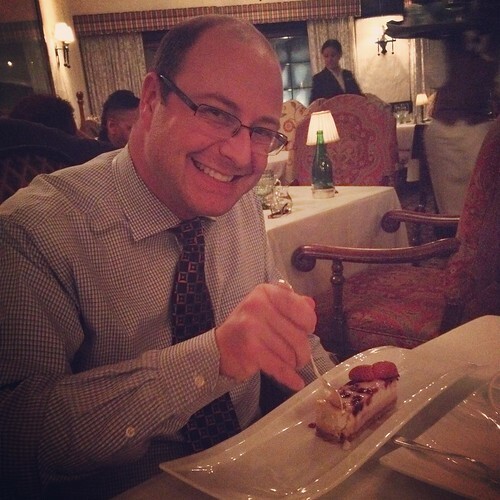 Dan eating his dessert at The Waterlot Inn. 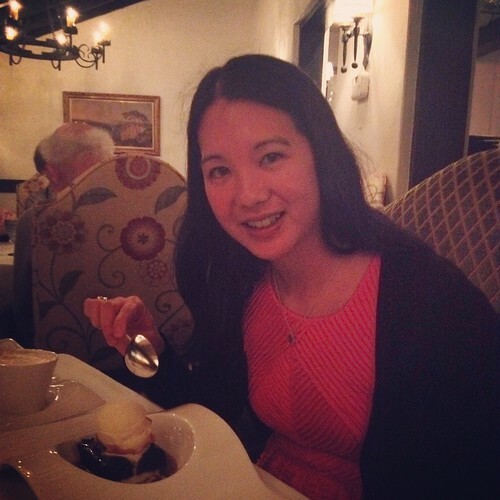 With my dessert at The Waterlot Inn. 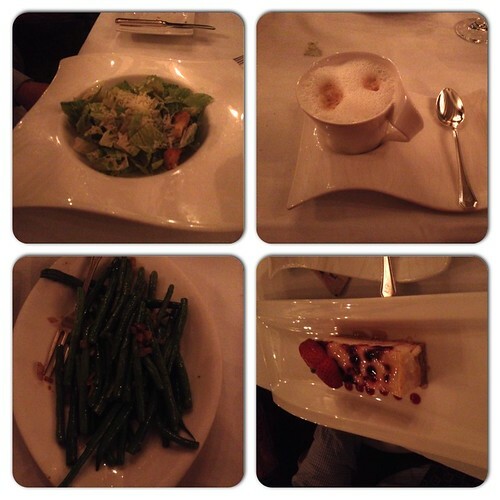 All of the food was amazing! 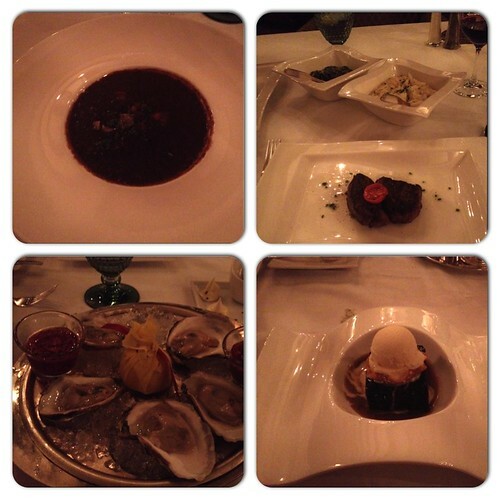 We had oysters and then indulged in their winterlicious menu. 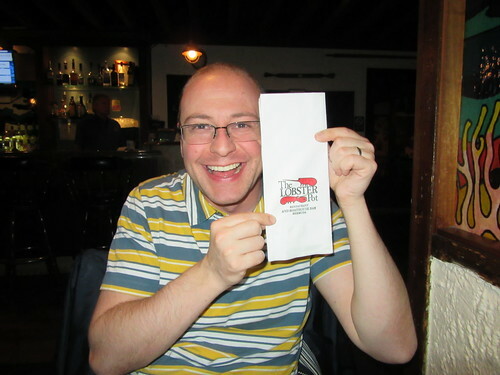 I had the Bermuda fish chowder, tenderloin with a side of creamy spinach and mashed potatos. For dessert I had the sticky toffee pudding. So good. Dan also had the tenderloin. He had a caesar salad to start and we also shared a side of green beans. He opted for the cheesecake. Dan and I in the stocks. A little old lady offered to take our picture. Dan outside the unfinished church. 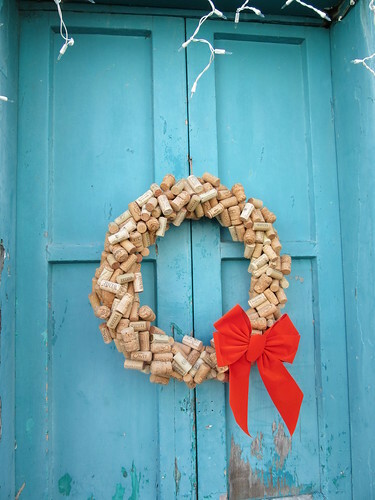 I loved this wreath made out of wine bottle corks. It looked so festive against the blue door. 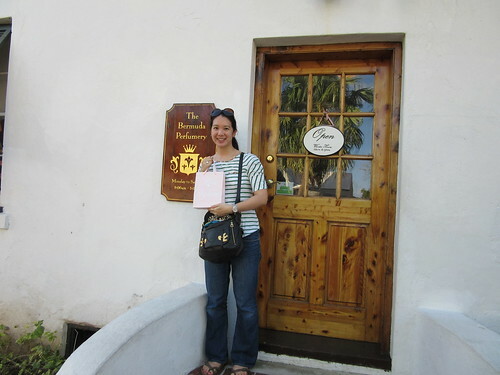 Me outside the Bermuda Perfumery. I bought some perfume here called Coral. View from the bus. The water looked so clear. 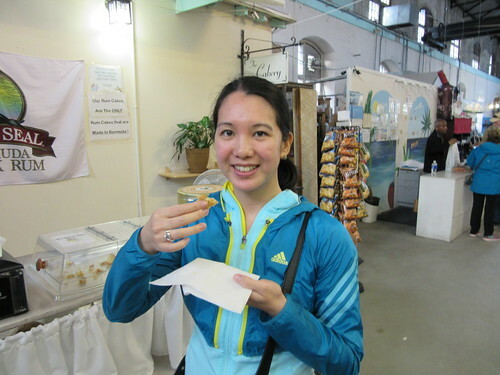 When we finished at St. George’s we took the bus back to Hamilton where we had dinner at The Lobster Pot. Dan ready for dinner at The Lobster Pot. We had another amazing winterlicious meal. Here’s a picture of my dessert. 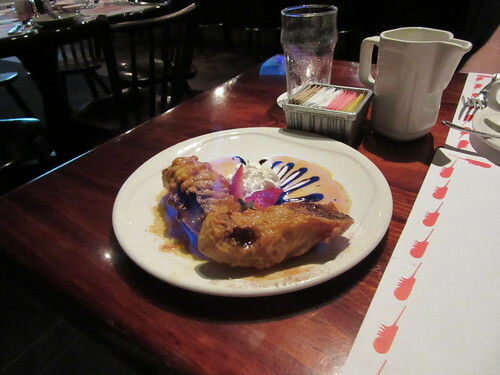 Banana fritters flambed in rum glaze. 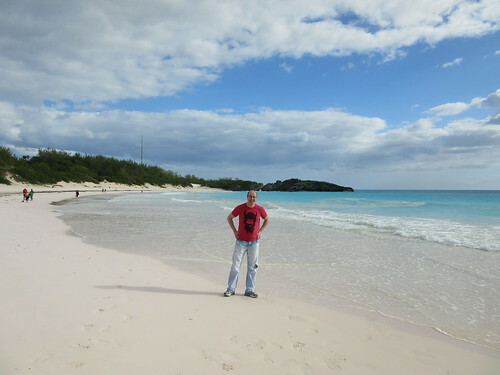 On our final day in Bermuda we walked to Horseshoe Bay Beach, the famous pink sand beach. The sand really was pink! 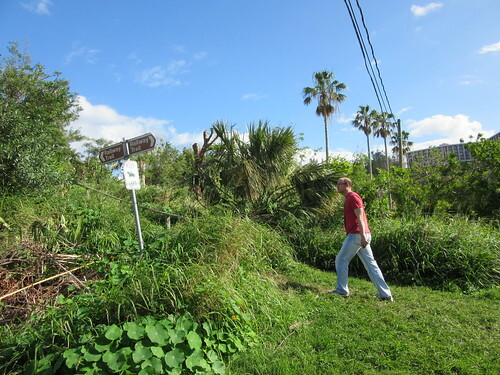 We also explored the Bermuda Railway Trail. 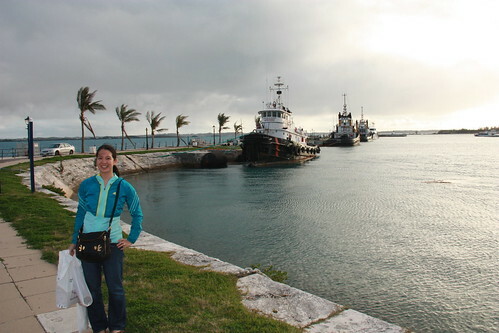 Sadly, we couldn’t stay in Bermuda forever. Dan at Horseshoe Bay Beach. 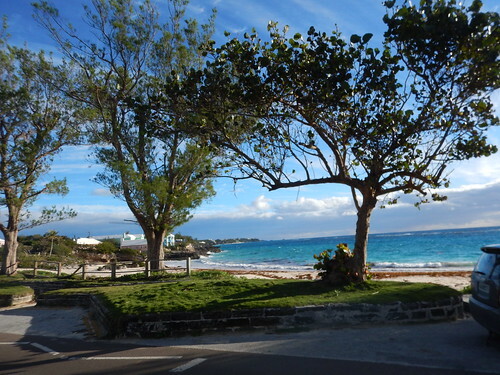 We were lucky to have a beautiful last day in Bermuda. 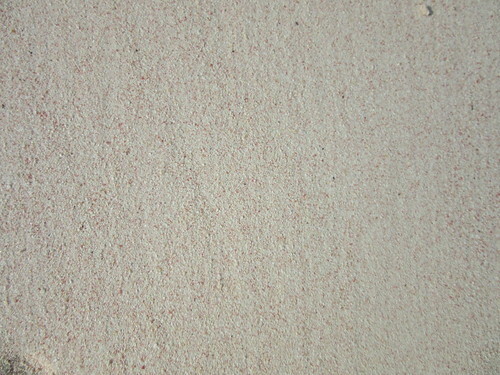 Close up of the pink sand. It really was pink! Dan heading to the railway trail. Dan and the railway trail. 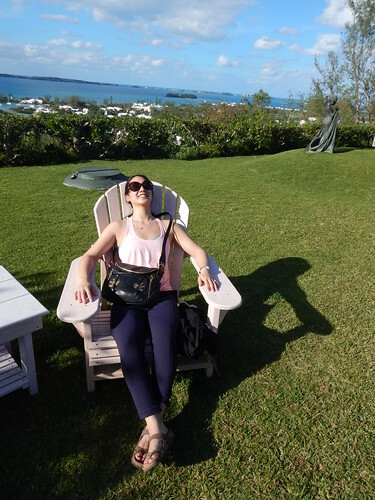 Basking in the sun at the Fairmont Southampton before we return to snowy Toronto. 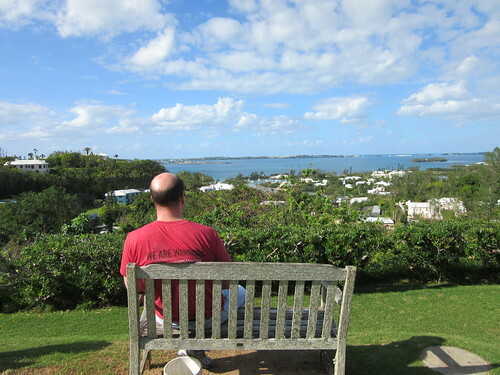 Dan enjoying the view from the grounds of the Fairmont Southampton before we head to the airport. 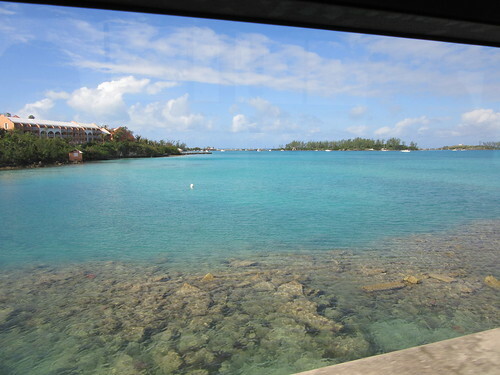 Last look before we leave Bermuda. Overall it was a great trip and the races were very well organized, challenging and fun. I felt extremely lucky with the good weather and would definitely recommend the race weekend. It was also fun to challenge myself with the Bermuda Triangle Challenge and this set of races really set the tone for the year to come. 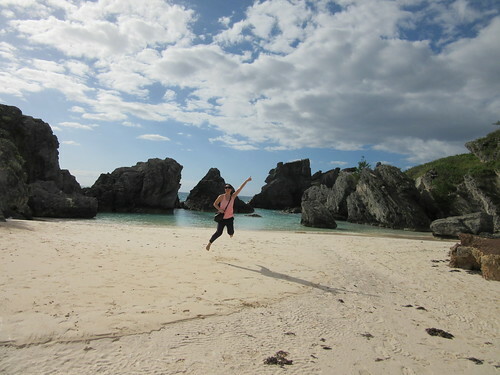 If you ever get the chance to go to Bermuda do it! You won’t regret it!